‘Hello’ said a voice beside him, and he banked in the air beating his wings in total surprise as the ‘alive’ figure flew next to him. “I’ve seen you before, watching, and I wanted to introduce myself. I’m Gil , a gargoyle …but I come alive at night…” … The crow could hardly believe he was still breathing and it suddenly dawned on him that ‘it’ could talk crow. 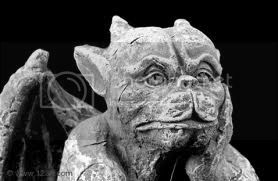 Amazing…or maybe he (Russell or Russ to his close friends) was understanding Gargoyle? Well, whatever the truth of the matter he was still alive and not in any immediate danger, so he landed on a stone wall sheltering the enclosed garden. 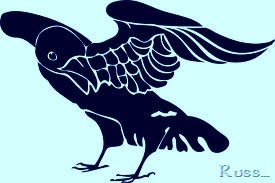 ‘So you can speak Crow?’ was the only thing he thought to squawk, and ‘Gil’ smiled, ( at least Russ thought it was a smile, a bit hard to tell in that craggy face) whilst landing on the wall and seated himself next to the crow. He replied “It seems so, my little black friend, so what’s your name?” Russ hesitated a few seconds, but thought it wise to be friendly and no harm in sharing his given name. “Russell, but Russ for short will do” and Gil proffered his hand, lightly shook Russ’s wing and said “Nice to meet you Russ, in fact it’s nice to be able to talk to someone other than myself, it can get quite boring you know?” Russ nearly backed away still feeling quite jittery, but managed to hold his ground and let the Gargoyle seal their friendship. ‘Wing shake? Strange customs these Gargoyle’s had’ he thought to himself ‘but best be friendly if he wanted some help’ He flew onto Gils shoulder and with one beady eye fixed directly onto Gils, he asked the question he had been trying to force himself to voice, “Would you aid me in my quest?” At the tone in the Crows voice, Gils face changed into one of concern and he asked quickly “ Is everything OK? How can I help you?” and Russ realised he had the gargoyles attention, Gil actually would help him. “It’s my mate, she won’t agree to nest with me unless I bring her a trophy, showing my strength of character. I don’t know where she gets her ideas from. Surely just by looking at me you can tell my ‘character’? MY feathers are as black and full of sheen as any crow, my wings are curved so well, and as for my body and well defined legs, well, no other crow has my shape and speed in the air” Gil hid a smile whilst replying “Maybe she wants to know you are ready for settling down?” and Russ thought for a few seconds and finally nodded, “You could be right, I have been lax in the nest building department, but what could I find as a trophy?” Gil sat and stared into the garden, thinking hard and wondering if he had the answer…What on earth would a female crow want trophy-wise? Until suddenly an idea came to him, “Maybe this would suffice?” he queried as he lifted a beautiful climbing rose flower from atop the garden wall, breathed on it softly and watched as it changed to marbled form. Delicate petals, beautifully intricate as only nature can produce were now marbled to last for a lifetime. Russ squawked in amazement and flew around Gil’s head, almost laughing in his joy at such a wonderful ‘trophy’… It was small and light enough for him to carry with ease, now surely his mate would accept him for his lovely gift? Gil smiled again and thought on how simple and rewarding to be able to lift another’s burden. He took a long thin climber strand and tied it to the marble rose, then placed it round Russ’s neck,… “There you are my friend, I hope you have a wonderful life together” and Russ pecked lightly at Gil’s cheek, “My thanks, Gil, and from this day onward, should you need any help at all, just tap this design three times, and any of my kind will answer you. 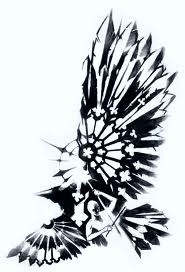 I am Russell, King of Crows and henceforth, you are Gil, true friend of our clan.” With that proclamation a Crow design appeared on Gils forearm, his mark of the Crow Clan showing to all his friendship from this day forward. They said goodbye to one another and Gil sighed happily to himself as he watched his new friend fly away. What a fantastic night this had been, a new friend found and he had helped someone in need. Not bad for a nights work, and at that thought he suddenly realised he should return to his Birth Stone, transformation time was nearly here. He quickly flew back to his plinth, placed in the middle of the lovely garden he now called home, and smiled fixedly as the fingers of dawn traced lightly across his now stone cold figure. His last thought was of sheer and utter happiness. Life was good…..